“Foods I didn’t discover until adulthood” are getting to be a theme on this blog, which I’m pretty sure is because there are so darn many of them. As a young child, I only ate three things we could reliably get outside of the house: hamburgers (well-done only, no pink), pepperoni pizza, and spaghetti with red sauce. Add a father with equally, er, selective tastes and you get a childhood with fairly limited cuisine. So that’s how it happened that I didn’t discover Indian food until I went to live in England for a year when I was twenty. (Other discoveries of the same year: sushi, falafel, and portobello mushrooms. Also wine and kir. It was a good time.) And then, for years, I ate amazing Indian food in restaurants, but utterly failed to recreate anything like it at home. Fortunately for all of us, that era is past. The secret, it turns out, is really great garam masala. 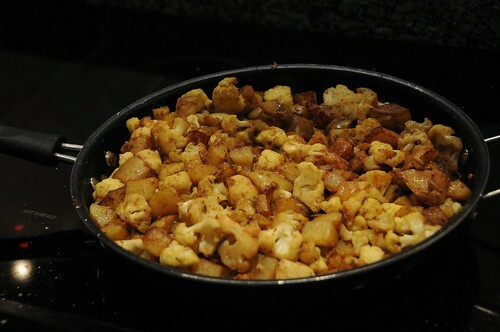 I buy it from an Indian grocery, but you can also get it online, and it is the difference between “random bunch of Indian-inspired spices” and “YUM.” This recipe for potatoes and cauliflower (aloo gobi) is a little less saucy than most restaurant preparations, but every bit as tasty. First, wash the potatoes. Chop into one-inch chunks. Line a plate with paper towels and set it to the side. Heat a large skillet with a lid* with a about three tablespoons of oil and the same amount of water over medium heat. When it is hot, add the potatoes and cover. Cook until the potatoes are cooked through, 7-12 minutes. While this is happening, chop off the stem of the cauliflower, and then chop it into florets, no more than about an inch and a half across. It’s okay to cut large natural florets into smaller pieces with a knife. Fry the potatoes until they are golden brown, stirring only occasionally, 3-5 minutes per side, adding oil as needed to prevent sticking. When the potatoes are done, use a spatula or slotted spoon to remove them to the prepared plate, and line a second plate with paper towels. 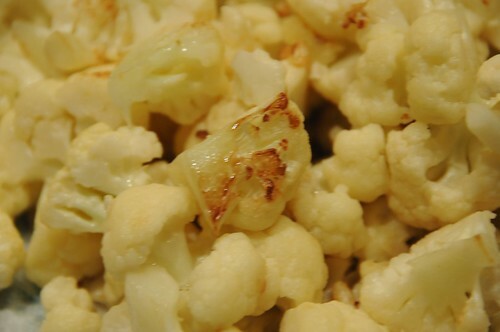 Add the cauliflower to the remaining oil (add more if needed!) and cook, stirring only occasionally, until it is soft and caramelized on the edges, 5-8 minutes. While it is cooking, peel and chop the onion. When the onion is soft, add the ginger to the skillet and cook half a minute, until it is fragrant. Add the other spices and stir to coat everything, then add the potatoes and cauliflower back in, along with three tablespoons of water. Stir everything to coat, then turn the heat down, cover, and allow to cook for about five minutes. This recipe makes about four servings and reheats beautifully. It also doubles well, but the vegetables really get some of their flavor from their contact with the pan during the initial frying (which caramelizes them to that lovely golden brown), so you may need to do that step in batches. *The lid doesn’t have to belong to the pot, just to cover it or the contents reasonably well. **I love a microplane grater for this; my favorite is a big flat one like this. Sounds tasty and not too difficult! Do you mean “add the potatoes and cauliflower back in” rather than the “onions and cauliflower”? @Debby: oops, yes! Thanks for the catch; fixed now. So, I tried this two nights ago! It was very good, but I had problems with the potatoes. After taking the lid off, I found they had stuck to the bottom of the pan. I think if I had put the oil in, coated the potatoes, then added the water and the lid at the same time, that may have prevented this. But there was kind of a cascade from there – they never really crisped up, and instead disintegrated gradually into the dish. I also wondered to what extent the shift work (taking things in and out of the pan) was necessary – I guess this is because I never got the potatoes to fry up, but what I got was pretty delicious, and putting more in the pot at the same time would remove this from being a half hour of something-to-do-at-all-times into a faster cook and a less attention-intensive one. Maybe a ballpark on how long it takes to cook would be useful too? This certainly didn’t take all afternoon, though. I did it with my kids hanging about and occasionally helping and it still took only about 40 minutes, and I’m sure if I had no help it would have been somewhat faster. All that said: Yum! I am going out to an Indian grocery this weekend to buy some spices and ingredients. Please more like this. @sconstant: I might as well admit that I’m actually working on an easier version of this, because I too was annoyed by all the pan shuffling! It’s a little fussier than I usually like, but I was pretty entranced with how these turned out. 1. Bake the potatoes in the microwave before dicing them, and then just finish them in the pan. It’ll take maybe 4-6 minutes per potato; turn them halfway through and don’t forget to pierce the skins before you start to prevent potato-splosions. When you can squish the sides and they give, they’re cooked. 2. You can cook them in an open pan the whole time. I made this recipe once this way, and it did work, but it meant that I had to cook for a long time at the end (once everything is back in the pot), maybe 25 minutes.